Here's a viewer's guide for this classic suspense thriller starring Farley Granger (left) and Robert Walker. Strangers on a Train (1951) begins with a familiar premise. We've all been minding our own business at the grocery store or in a restaurant when a total stranger suddenly appears and starts asking nosy questions. Most of those real-life encounters end innocently enough, but director Alfred Hitchcock has something much more sinister in mind in this suspense classic based on Patricia Highsmith's 1950 novel. On a train ride from New York to Washington D.C., successful tennis pro Guy Haines (Farley Granger) encounters Bruno Antony (Robert Walker), a charming clotheshorse who at first appears to be an overeager fan. Eventually, Bruno reveals a bizarre theory about murder and friendship that will change both men's lives. Alfred Hitchcock and his daughter, Patricia, on the set of Strangers on a Train (1951). Of course, Hitchcock was the master of suspense, but there are many noir elements in his work. His first American film, Rebecca (1940), with its Gothic shadows and fog, was a major noir influence. By 1951, film noir was dominating Hollywood, and Hitchcock was keen to put his unique stamp on the genre (I don't think Hitchcock had ever heard the term film noir, but he had several shots planned on his beloved storyboards that were inspired by the noir style). Strangers on a Train is first and foremost a Hitchcock film: Many of his obsessions like the trapped man and the psychopathic mamma's boy are on full display, but Hitchcock does add a layer of noir style to the crisp black-and-white cinematography. The opening scene: A hallmark of the noir style was to film actors from behind or at other odd angles. Last week's noir, Kiss Me Deadly, often photographed actor's feet. Director Robert Aldrich did this to subvert the production code; by showing a woman's feet flailing he could imply torture without actually showing any onscreen violence. Hitchcock uses this technique in Strangers on a Train, but he does it for different reasons. The opening scene (clip below) introduces both lead characters through a long sequence showing only their shoes walking towards the train. Each man's distinctive footwear -- Bruno's flashy brogues and Guy's basic business shoes -- reveal quite a lot about their respective characters before the audience even sees their faces. Night Scenes: Virtually, all films noir have night scenes, but Hitchcock raises the stakes with two elaborate scenes set at an outdoor amusement park. Warner Bros. constructed an amusement park set on a San Fernando Valley ranch complete with a working Ferris Wheel -- Hitchcock, who liked practical jokes, once left his daughter Patricia on it for an hour. Mirrors: Another hallmark of the noir style is reflecting the action through mirrors. It's hard to top the mirror-palooza that is the finale of Orson Welles' The Lady from Shanghai (1947), but Hitchcock does it with a single flawless shot of a murder being reflected in a pair of glasses. 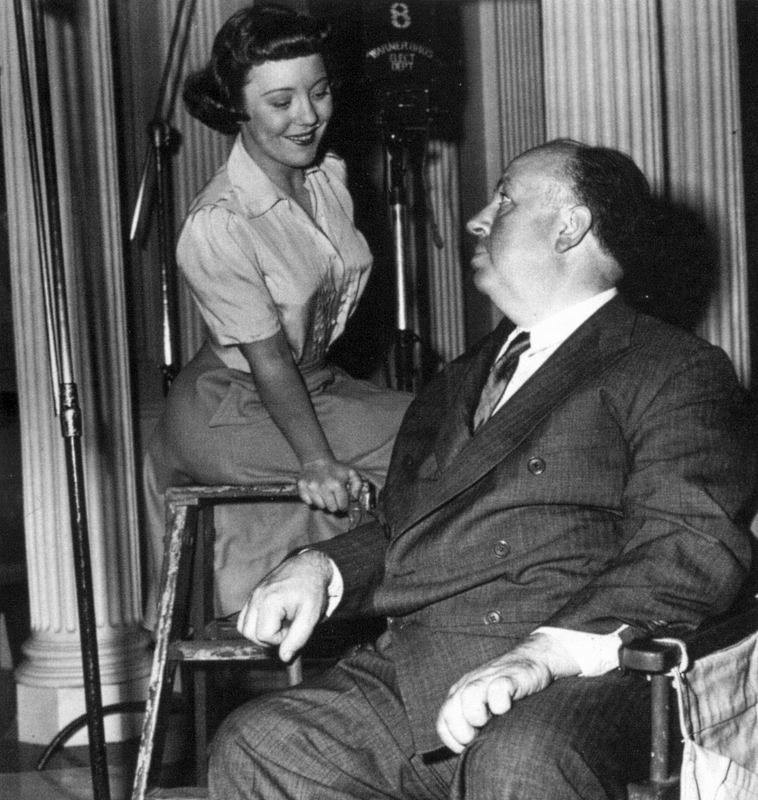 Hitchcock achieved this effect by double-printing two shots: The first is of Walker and actress Laura Elliot on location and the other is of Elliot alone on a set built with concave mirrors. Shadows: The most "noir" scene in Strangers on a Train comes in the middle of the movie. Bruno has murdered Guy's wife, and now he expects Guy to fulfill his end of "the arrangement." The scene begins with Granger bathed in light from a street lamp. He then slowly descends into the darkness -- Bruno is hiding in a driveway across the street -- until his face is almost obscured in shadow. 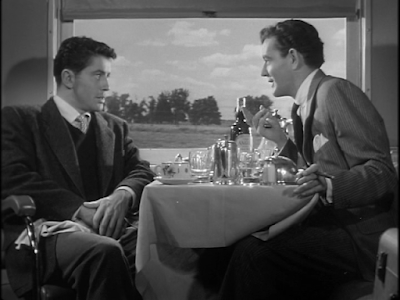 Strangers On a Train will air at 8 p.m. Aug. 9 on TCM as part of the Summer Under the Stars tribute to Robert Walker. It is also available on DVD and video on demand.